The Difference Between Cardiac Arrest and a Heart Attack - Cardiac Care & Safety, Inc. 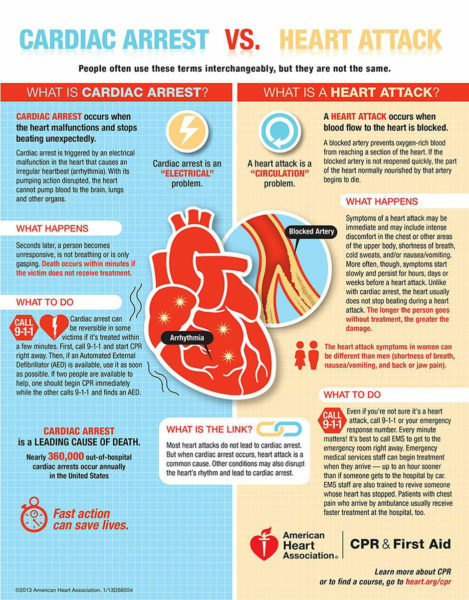 The Difference Between Cardiac Arrest and a Heart Attack - Cardiac Care & Safety, Inc. If you thought cardiac arrest and heart attack were interchangeable terms, you’re actually incorrect. Learn about the differences as well as how to respond to each occurrence from this infographic by the American Heart Association.